About 50 years ago, Virginia Daly bred an Abyssinian cat and a Siamese with the intension of creating a cat that had Abyssinian-points on a Siamese cat’s body. The first litter looked very Abyssinian since it is dominant over Siamese gene patterns. The second litter however was a success but contained one cat that was ivory colored and had golden spots. This cat was named Tonga and caught the eyes of a few cat enthusiasts who loved the wild markings. Tonga was the first Ocicat. Since then, breeders have developed several variations on the colors and spots, which give the Ocicats a broad and healthy genetic lineage. 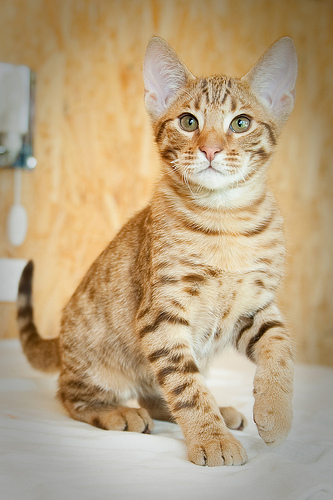 What does an Ocicat look like? Ocicats should be larger than your typical domestic shorthaired cat and have a well-muscle toned body. Their fur should be short, close to the body, and have a satin sheen that compliments their markings. Their legs are long; their torso should feel tight and solid. Ocicats also weigh more than you would expect and are considerably active. Want a dog that’s litter-boxed trained and cleans itself? That’s the Ocicat in a nutshell. They are active, athletic, energetic, and talk. These cats are more dependent on companionship than other breeds and won’t thrive in a house that is empty a lot. Ocicats are intelligent and can learn to respond to their name, can learn a few tricks with a patient owner, and some like to play fetch. They are very loving and affectionate and bond deeply with their owners and may choose one member of the household over the others. It is always their choice. They will also gladly meet any friends that come over. These cats are extroverted. Ocicats are fairly hearty and may live up to 18 yrs. There aren’t any specific health issues directly related to the Ocicat. Some may develop renal or liver problems and some may have gingivitis. A good bloodline hopefully has worked to diminish these problems. Regular vet checks will also help ensure your cat lives a long healthy life. To summarize, the Ocicat is a domestic cat that is more dog-like and has striking coloring and spots. They aren’t for the average owner. If they are left to their own devices they may make a mess of your place. Ocicats will talk at you and can become quite chatty. They are highly intelligent and capable of learning tricks. Some tricks may include learning how to open a cabinet or pantry so beware that an Ocicat can be mischievous. If you’re interested in adopting an Ocicat, there are plenty of rescue organizations and breeders that can be found. One site that has a lot of great information on adopting an Ocicat is the Purebreed Cat Rescue site. You can also look for breeders in your area and learn more about them at the Ocicat Breed website. I hav had two ocicats. Rascal lived to be 19 and Enzo is now four. The ocicat breed is so loving and smart. They really are special and FULL of personality. I have had an ocicat in my life now since I was four.. From a childhood family member to now they are amazing and I can’t imagine life without ! She is a totally amusing feline and a great companion. Ocicats are awesome! My Oci is 13 years old, in good health, weighs 11 pounds, and is still very active and always up to something. He loves going for walks on his harness, playing fetch, and learning new things. He does get into cabinets just like the artcle says, so I have never been able to keep cleaning supplies or cat treats in the lower ones! I highly recommend Ocicats to people who have the time to spend with them as they generally don’t do well if left alone a lot (getting two Ocicats is better if you will need to be gone to work for hours each day). Of course not all cats fit the breed profile perfectly, so always make sure you spend time getting to know any potential new cats as individuals before you bring one home. Great article! I have been studing these cats they seem like really good freind because they are not shy they are playful I just love them.